Wanna sound all fancypants when a friend invites you to a potluck brunch? 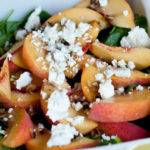 Tell them you’ll bring a salad of peach slices over spinach sprinkled with goat cheese and walnuts topped off with French sorrel salad dressing. Olga recently invited Sylvie and me for a girls’ lunch where she served a delicious lamb dish. I was tasked with bringing salad, one of my favorite dishes with which to experiment. So what did I have on hand? 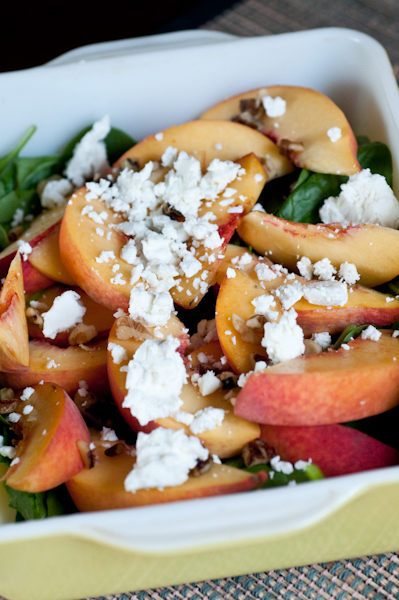 Cheese, nuts, spinach and fresh peaches. And French sorrel. A friend gave me the sorrel from her CSA (community assisted agriculture) share, and I was pretty stumped about what to do with it. So I read up on it a bit and the idea of a dressing kept cropping up all over the internet. In a blender, finely chop/puree sorrel. Add one small garlic clove, a few sprigs of lemon basil, a generous pour of olive oil, a squirt of lemon juice and a couple pinches of salt. Blend, adding olive oil to get dressing to desired consistency. Taste as you add a little of this and a little of that until you achieve a pleasing combination of flavors. 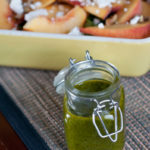 This dressing is delicious atop a salad consisting of a bed of baby spinach, sliced fresh peaches, creamy goat cheese and crunchy walnuts. Sorrel is versatile in that in can be used as an herb or a green. It also happens to be a very rich source of Vitamin C, and contains Vitamin A, so this dressing proves to be a lovely nutritional addition to a powerhouse salad. What do you make with sorrel? What’s your favorite summer salad?